Paris experienced a commuter chaos on Wednesday night, after an outraged passenger attacked a train driver on the RER A regional train line on the outskirts of the French capital. 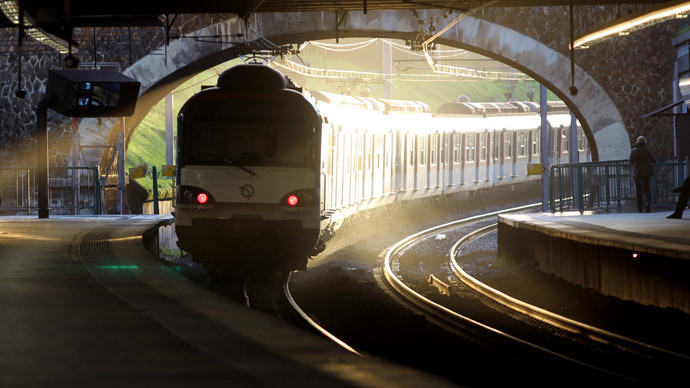 In the suburb of Torcy, the passenger set off the train alarm system after his hand got stuck in the closing doors, and then head-butted the driver, who had left his cabin to reset the alarm system. The passenger then fled, and the train driver had to be taken to hospital with a broken nose, French newspaper Le Parisien reported. This could have ended there, but the attack caused a strike among other train drivers, in turn triggering disruptions on the RER A line. It runs through the city center, so commuter chaos began across the whole city. Additional buses had to be arranged to take angry passengers to their workplace, but still havoc reigned at major Metro stations such as St. Lazare. The Secretary of State for Transport has expressed his "solidarity" with the attacked driver, but said that the interruption of traffic on the busiest line in Europe "can’t be the right answer." RER A serves about 1 million passengers a day, connecting the western suburbs to the Defense business area and the city center.